The past few weeks have been a research mad house. 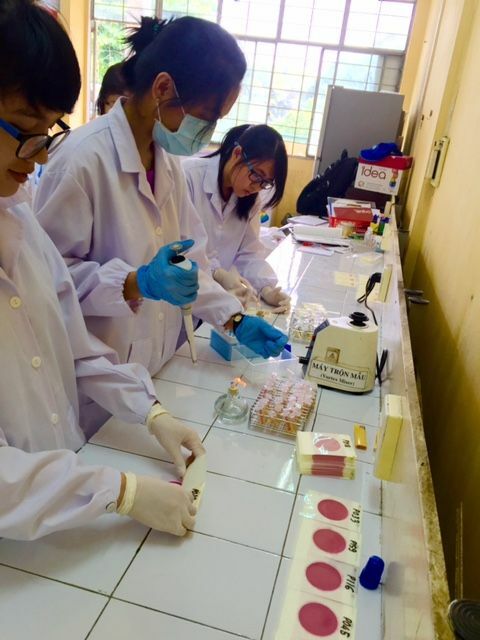 After collecting one hundred and eighty samples from the markets in Ho Chi Minh City microbiological analysis commenced. The procedures that I produced had only been practiced once in Vietnam with only three samples, so 180 samples was a massive undertaking. None of the preparation that I had done the past six months prepared me for leading a group of eight people to do something that I had never completed on my own. This first region had many difficulties with procedures, but in the end, the research team produced a solid procedure that will be used for the following two regions. Not only did we do microbiological testing, we also recorded observational data, such as, water availability, lighting, cleanliness, and hygiene conditions for each sample purchased. After sampling my fellow grad student, Phuong Vu, conducted one hundred surveys with a team of five undergraduates for each market, totaling six hundred surveys. These surveys will help us provide recommendations for safety interventions and a consumers’ willingness to pay for these improvements. Phuong Vu is using beef that was collected at each market to conduct a sensory panel and chemical analysis. 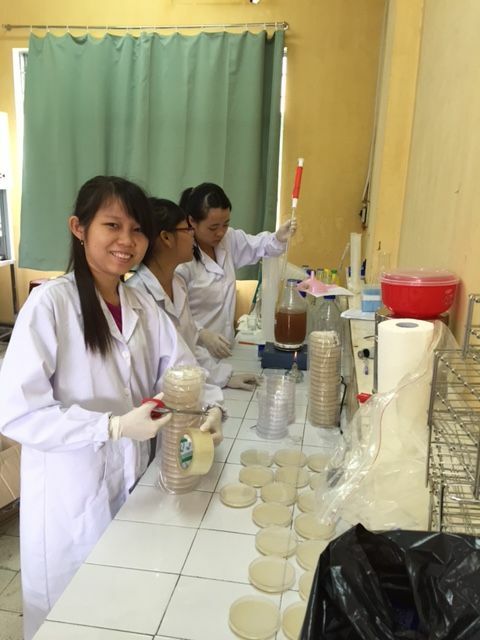 Without the help of the undergrad and graduate students at Ho Chi Minh City University of Technology, there is no way this project would be where it is. I would still be translating invoices and trying to find my way on the bus. When I was in America, I knew I could always go ask a question or have Dr. Dinh tell me systematically what to do. This project has helped me learn how to think like a leader instead of a worker and to constantly ask questions about everything, then find the answer myself. I am very excited to continue with sample collections and to keep exploring Vietnam. I am currently on holiday for Lunar New Year, or Tet, for two weeks in Nha Trang. So far, I am really enjoying the more scenic views of Nha Trang, especially the beach. I am use to the beaches in Galveston, Texas, which can sometimes be a bit stinky and not very clear water. This beach is exactly what I think about when I think about a beach, saltiness in the air, rolling waves, a nice breeze, plenty of sunshine.Although I have encountered more speedos than I will ever need to see. Unlike America, the other countries of the world have no shame, especially Russia and Italy! No shame at all. I hope that I will get to see some of the other sites of Vietnam when the research wraps up, but until then nose to the grindstone.